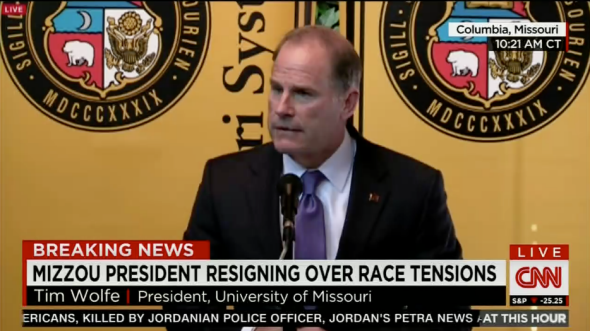 University of Missouri president Tim Wolfe resigns. University of Missouri president Tim Wolfe announcing his resignation at a press conference in Columbia. President Tim Wolfe said Monday that his resignation is effective immediately. The announcement came at a special meeting of the university system’s governing body, the Board of Curators … For months, black student groups have complained of racial slurs and other slights on the overwhelmingly white flagship campus of the state’s four-college system. Frustrations flared during a homecoming parade Oct. 10 when black protesters blocked Wolfe’s car, and he did not get out and talk to them. They were removed by police. Graduate student groups had planned walkouts today and Tuesday and a campus sit-in began last Monday.